July 13, 2018, ©. Leeham News: Last week we discussed ADS-B in capabilities and how the US second channel at 978MHz brings the bandwidth for many useful services. Before we discuss what improvements in navigation ADS-B will bring long-term, let’s sidetrack to describe the present Traffic Collision Avoidance System (TCAS) and why it’s eventual replacement with ADS-B will improve air safety further. Some nasty airliner midair collisions in the 1950s showed the necessity for some sort of aircraft proximity warning system. The Mk 1 Pilot eyeball could not cover aircraft which one couldn’t see. “The two A320 were hardly 4 miles from each other while the Vertical separation was just 200 feet triggering Traffic Collision Avoidance System (TCAS) on both aircraft”. The TCAS system sends interrogation signals to all other surrounding aircraft several times per second, using the aircraft’s Transponder as sender, Figure 2. The interrogation is a normal transponder interrogation so a small aircraft with a Mode C transponder would answer as if it was ATC asking for a send back of ID and altitude. Figure 2. 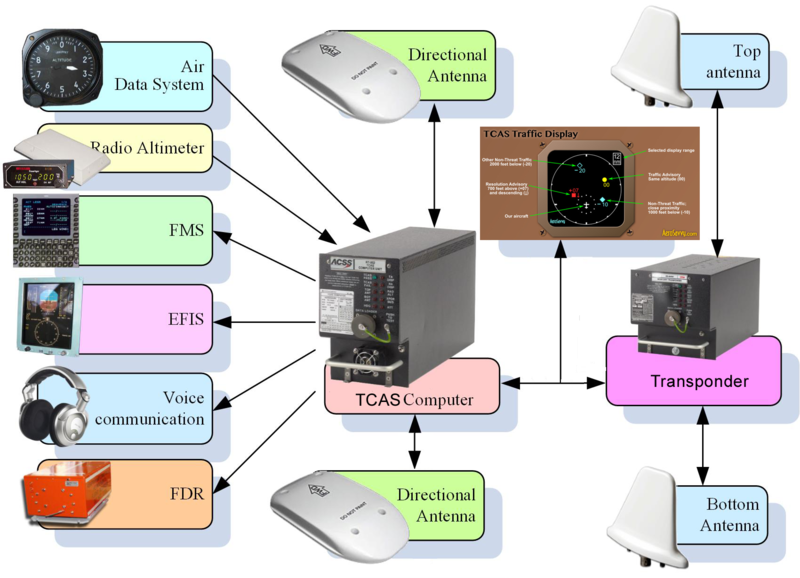 TCAS system with the different parts and communication links. Source: avfionics.sciary.com and Leeham Co. The TCAS system adds directional antennas on the aircraft’s top and bottom sides in addition to the Transponder’s antennas, to receive the response. With these, the TCAS of the interrogating aircraft can decide the direction of the aircraft which responded. Range to the aircraft is determined through the delay time of the response. The TCAS computer then calculates the direction, altitude and movement of the responding aircraft. The result was originally displayed on a TCAS display. Today it’s presented on an airliner’s Navigation display, superimposed on the route. 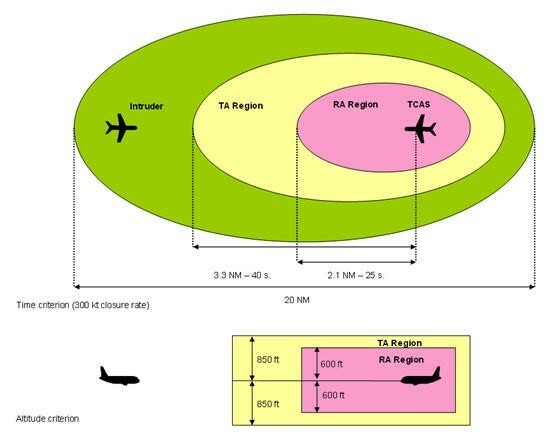 The actions of the system are divided into Traffic Advisory (TA) when the conflicting aircraft is faraway and Resolution Advisory (RA) when the conflicting aircraft is close, Figure 3 and 1. Figure 3. Example of TCAS actions. Source: Wikipedia. Traffic Advisory tells the pilots another aircraft is in the vicinity. Resolution Advisory commands the conflicting aircraft to separate in altitude. 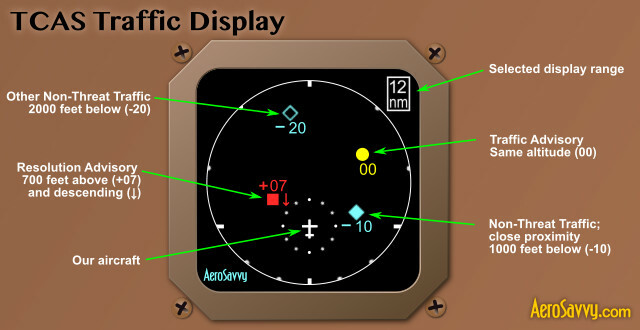 Direction resolution is not used as the directional antennas only give a rough direction to the responding aircraft. The altitude in the transponder response is accurate, the system’s calculated direction is not. Therefore the system issues climb/descent commands once two aircraft are inside the red region. The transponder conversation between the aircraft resolves who will climb and who will descent. The command is then given aurally and on the display for the two TCAS equipped aircraft. With ADS-B fully implemented an accurate position and movement of all aircraft in the vicinity is known to the TCAS computer. Therefore more intelligent TCAS commands can be implemented. Next Corner we will discuss what more clever functions can be implemented when all surrounding aircraft have ADS-B. The key here is to design systems / procedures while keeping the human at the center, avoiding false alarms and for reasonable costs. „The TCAS system sends interrogation signals to all other surrounding aircraft several times per second“. ADS-B: all send ADS-B twice a second. Every aircraft emits requests may be 5 times per second and receives answers from 9 aircraft 5 times per second. 50 signals for just one aircraft and 500 for all together. I too have mixed feelings. In the case of the Controller induced collision over Germany. In that case there was some ambiguity of ATC vs TCAS. I would have followed TCAS, I know too well the fallibility of human being and TCAS dictates a climb and a decent, ergo, if I am being told to climb the other aircraft will be descending. Clearly an situation where you have to make a micro second decision. While not proven, you have a Russian culture of ATC controls the air not the pilot (regardless of what Western PIC says). I can see an advance advisory to climb a few hundred feet, change course a few degrees etc. And how do you combine the two if you have left and right advisory/directive with two systems in play? Hopefully they get it right. All too often advanced tech has to fail before they figure out it was not the right approach. According to this incident near Überlingen German authority for aircraft accident BFU recommended to ICAO that TCAS should overrule ATC because TCAS coordinates both aircraft while in the Überlingen accident ATC did contact only one aircraft.